Paperback, 8.5 x 10.75 in. / 144 pgs / 100 color / 20 duotone. 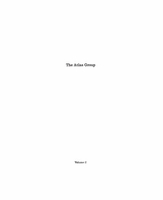 Text by Alan Gilbert, Blake Stimson, Hélène Chouteau-Matikian. What is a photographic image? Can a photograph ever tell the truth? These are some of the questions artist Walid Raad (born 1967) has been investigating for the past 20 years, in a practice that encompasses photography, film and video, sculpture, installation and performance. 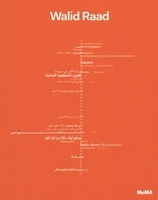 This publication brings together three major bodies of work: the photographic and video works produced under the fictional collective name The Atlas Group; various series of seemingly "straight" photography of his native Beirut titled Sweet Talk: Commissions (Beirut); and his most recent project, Scratching on Things I Could Disavow: A History of Art in the Arab World. 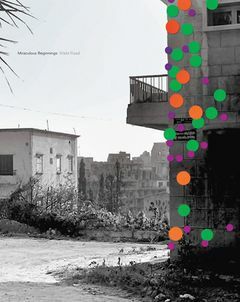 The publication includes an exchange between the artist and curator Achim Borchardt-Hume; an essay on conceptions of truth by poet and writer Alan Gilbert; a text on Raad's use of photography and its ties to Beirut by Blake Stimson; and an essay by Hélène Chouteau-Matikian. 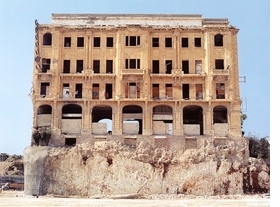 Building Downtown, made in Beirut, Lebanon, is reproduced from Walid Raad. "The traumas and catastrophes of the twentieth century dislodged a modern European notion of history as a series of increasingly perfectible stages, yet the writing of history has not always reflected this disruption. Perhaps this is because it is nearly impossible to depict simultaneously both history and its interruption. Yet for the past two decades, Walid Raad has obsessively and patiently, passionately and even quixotically attempted to do just this. The fact that failure is built into this process is part of the appeal of Raad’s work; so too is its subtle, formal beauty. While the interruption of history, whether personal or collective, is frequently the result of disaster, there are of course various traditions--secular and otherwise--in which a historical rift signals the arrival of a new time and era. Raad’s art seeks to illustrate on an individual and social level the devastation wrought when the historical continuum is broken; yet his work also shows that this disruption can itself be the escape from a traumatic history." Alan Gilbert, excerpted from Walid Raad. FORMAT: Pbk, 8.5 x 10.75 in. / 144 pgs / 100 color / 20 duotone.